Abstract: The author of the article, using contemporary interdisciplinary methods of study (including those from the field of social psychology), sets out to explain the mechanisms of fear employed by Slavs against the Roman army. 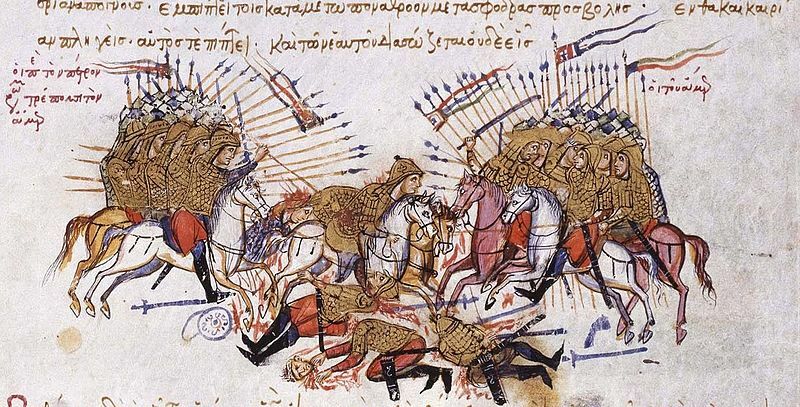 The study covered 6th century historical sources depicting the fighting methods of the Slavs. A more in-depth analysis focused on the issue of fear in relation to group conformism, described in detail in Strategikon (the essential Later Roman military treatise). Introduction: Fear has always been and probably for many years will still remain the dominant emotion accompanying troops on the field of battle . Throughout the ages man attempted to suppress fear by various means – alcohol , narcotics, battle frenzy, or by replacing it with an even stronger fear. However; nobody has yet succeeded to completely eliminate anxiety in soldiers. A trooper devoid of instincts would be little more than a soulless instrument, and although fear may lead the soldiers to become paralyzed or even flee, it is also a powerful motivator for positive results. The feeling of terror has been a constant companion to fighting men. This holds true for any historical period, regardless of available source materials or the methods employed to study the human psyche. Soldiers of antiquity often had to face terrifying and downright alien foes in combat where no quarter was given. In the moments leading up to a fight men were surely anxious about the outcome, their own instincts urging them to flee from danger. Although Roman military drills were supposed to help men overcome their fears by inspiring a sense of duty and teaching certain automatic reactions, it was still a common occurrence for legionnaires to flee from the battlefield. Interestingly enough, fear itself was employed to prevent this from happening, as any units that ran away were decimated. Applying collective responsibility established a group control mechanism, and the inevitable punishment served as additional motivation to make sure that even the faintest of heart do not turn and run. Late Roman laws are full of provisions that encouraged very strict punishments for deserters, especially those that fled in the face of the enemy. The existence of such laws makes it clear that our image of the Roman army is highly idealized and that even in this well-oiled military machine there were still individuals who succumbed to terror when facing the enemy. But would it be possible to investigate the mechanism of inspiring fear? Did the enemies of Rome make intentional attempts to evoke this feeling in the legionnaires, and if so, then by what means?